Traditional street bloco parties have made a strong comeback in Brazil, with attendance in the millions and most cities in the country hosting at least one. SÃO PAULO, BRAZIL – Carnival was in full swing in Brazil this weekend, with street parades occurring in every major city in the country. From samba, to the frevo music rhythm, to rock and even jazz there was something for everyone during this year’s Carnival festivities in Brazil. Partygoers in Rio enjoy one of the many street bloco parades which occurred during the weekend, photo by Fernando Frazao/Agencia Brasil. While over 300,000 thousand showed up for one of the most traditional street bloco parties in Rio, Simpatia é Quase Amor (Sympathy is Almost Love) in Ipanema, a few kilometers away a smaller crowd of a few hundred party-goers enjoyed the smooth, cool rhythm of jazz music, in the second day of the Lavradio Jazz Fest. 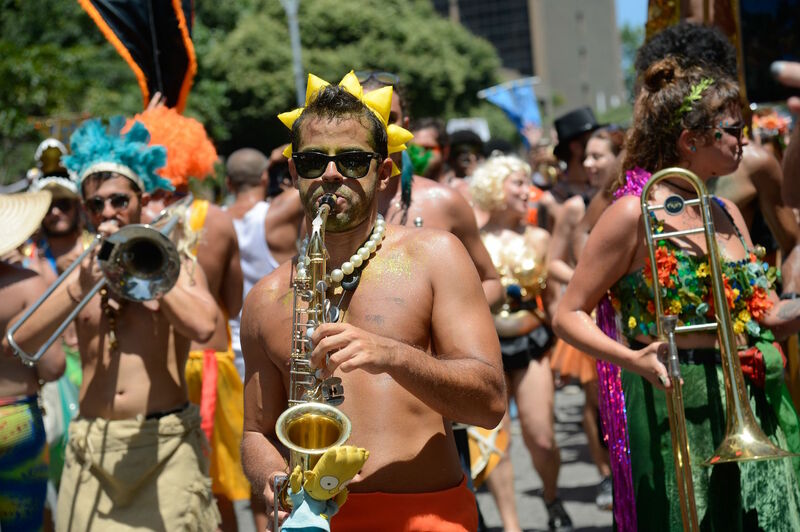 The city, which also hosts the most famous samba school parades in the world, also attracts hundreds of thousands to the 437 street bloco parades scheduled to perform during this Carnival season, held from February 3rd to February 18th. In São Paulo, more than 1.5 million attended street bloco parties on Saturday and Sunday, in what during the workweek is one of the city’s busiest highways, 23 de Maio. Instead of mega traffic jams, the highway was filled with hundreds of thousands of people who danced and sang along to rock, funk and samba music. In the country’s capital, Brasilia, not traditionally known for their Carnival festivities, the weekend highlight went to the innumerous children samba bloco parties. The traditional adult glitter-and-plume costumes gave way to mini Minnies, Spidermans and pirates. The bloco parties had children’s games and face painting along with traditional samba songs to get youngsters in the mood. Home to some of the country’s most famous rock bands, Brasilia, also hosted a bloco party with rock songs, which brought together more than 1.5 million partygoers on Sunday. And while in the Center, South and Southeastern regions of the country, samba music reigns supreme, in the North and Northeastern parts of the country, frevo and maracatu music is the most common music heard during Carnival. In Olinda, near Recife, Pernambuco, ten large music stages were set up for bands to keep party revelers going day and night. The city, with its historic cobblestone streets, is said to host one of the largest crowds during Carnival in Brazil, coming close to crowds seen in Rio de Janeiro and Salvador, Bahia. This past weekend more than two million people danced their way through the city’s streets, according to officials.